The big news in marketing management this year was the continuing issues around media transparency, rebates and kickbacks. This year the controversy continued when the parent company of the Dentsu Aegis Network, Dentsu Inc. admitted to overcharging their clients including Toyota Motor Corporation in regards to their digital media. For any advertiser investing in media advertising, the time has come to address this issue. Darren Woolley, founder and Global CEO shares how. Following the revelations of the media agency transparency crisis, many major and global advertisers immediately pitched their media agencies leading to billions of dollars in media contracts changing from one agency to another. What was actually achieved in what came to be known as the Mediapalooza? David Angell, the Media Lead and General Manager for TrinityP3 shares a case study here on how an advertiser achieved increased performance, value and transparency without a media pitch. Some advertisers are finding the revelations of the media transparency crisis a major challenge. Yet, as Nathan Hodges, Managing Director at TrinityP3 points out, there are some very practical first steps that advertisers can take to address this issue. The important thing is to make a plan and implement it rather than worrying about what to do. If not, then the longer you wait, the more of your media investment you could be wasting. While a lot of the focus regarding media agency transparency is on the media agency, the fact is that this behaviour has been encouraged, or at the least enabled, by the behaviour of the advertisers. Here David Angell, Media Lead and General Manager at TrinityP3 highlights some of the advertiser behaviour that encourages or leads to issues with media transparency, performance and value. Is Media Transparency desirable only until it costs advertisers money? Some of the media agencies are laying the blame for the media transparency and kick-back crisis at the feet of their advertiser clients, and highlight that if higher levels of transparency are required, then advertisers may have to pay more than they do now. 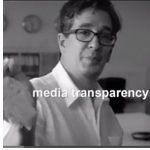 Darren Woolley, founder and Global CEO of TrinityP3 explores the issues of what the cost of media transparency is and asks the question, is the industry ready to pay the price to achieve it? If you read some of the recommendations on how to address this issue, the media auditors usually recommend undertaking an audit. Not surprising really. But we have found that media audits really only show you the past. To make improvements to the performance, value and level of transparency you need to assess and redesign the way you manage, engage and assess your media agency. Read more about the TrinityP3 Transparency, Value and Performance Assessment here. 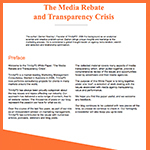 Want to understand the media rebate and transparency crisis better? This White Paper provides the historical context and framework for how this evolved like a slow motion train wreck, and what advertisers can do in response. Get your free White Paper here. A leading university worked with us to find a new PR partner. We advised a major media player on how its pricing model compares with the industry. A large car manufacturer asked us to assess the remuneration arrangement with one of their digital partners. We supplied a very fast turnaround TV assessment for a FMCG business. One of the Australia’s larger medical associations asked us to review and advise on a new complex media arrangement. PR tender assistance was given to one of leading automobile suppliers. A healthcare provider engaged TrinityP3 to help find both a new creative and media agency. Our European office ran a series of successful digital workshops to up-skill a leading marketing team. Finally, we worked closely with an Australian financial institution on their media remuneration. Are you working at an Agency?